Karlovy Vary is another important reason why people come to the Czech Republic. This region can boast of famous healing hot-springs, fabulous resorts, amazing nature as well as rich local traditions. But even that is not all. Here you can take the advantage of active winter time spending – skiing and snowboarding. In this article, we will find out where are the best ski resorts in Karlovy Vary. Ski resort Klinovec is located 150 kilometers from Prague, and 27 kilometers from the world-famous resort of Karlovy Vary. Klinovec Mountain offers 1244 meters’ descent. This route is designed not for professionals, but for those whose aim is relaxation with family. That is why there are also lots of quite safe slopes. The total length of the trails is 70 kilometers. 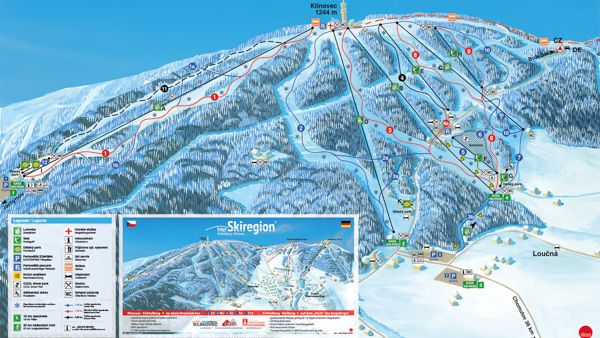 The ski resort in Karlovy Vary Klinovec has 6 types of trails of different complexity – 1 black track, 3 blue, and 2 red ones. They are serviced by seven lifts. The price for a one-day ski-pass is 15 Euro for adults and 10 for kids. On the territory of the resort, there are also many stores, equipment rental services, bars, restaurants, hotels, ski schools, and 4 free parking spaces. 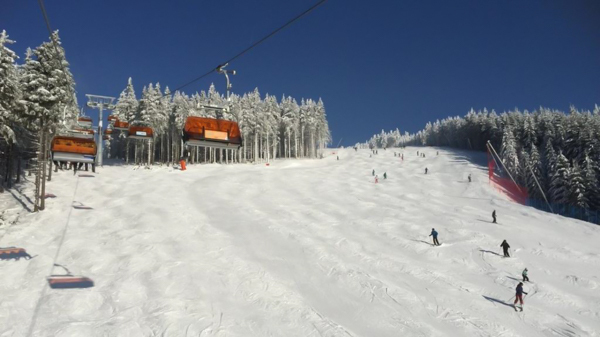 To find the prices for rentals and ski passes in Klinovec ski area, you can visit the official web page https://klinovec.cz/en/lanovky-a-vleky There are also links for web cameras to check the weather forecast and lifts that operate. 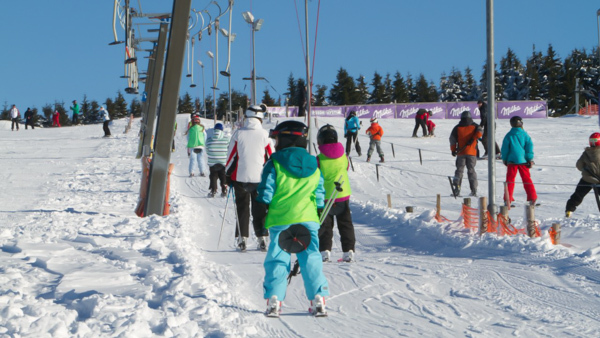 Ski Areal Novako in Karlovy Vary is developed mainly for beginners and for families with kids. For your comfort, there is a ski school, a playground for children and stores, where you can buy equipment. You can also rent all the equipment required. On the tracks with artificial lighting, you can enjoy ski in the evening. 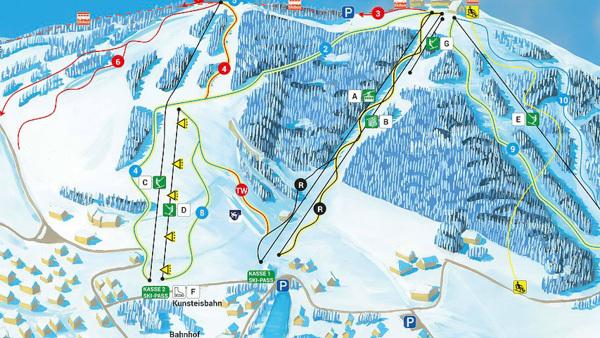 The total length of trails is 350 meters (blue route) with 2 lifts serving it. 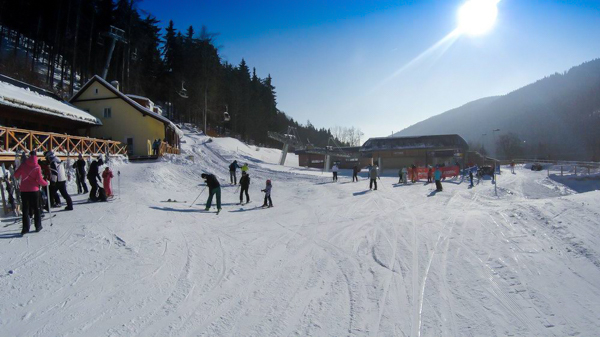 For more information about the season start in Novako ski areal, weather and hills conditions I recommend visiting official page http://novako-ski.cz/en/zima/ You will also have a chance to find web-cameras and contacts for trainers in ski school. Ski resort Fichtelberg is another good option among ski resorts in Karlovy Vary, where you can enjoy quite easy slopes with no extreme. The total length of the routes is 15.5 kilometers. Both professionals and beginners will find the perfect spot. Besides, nature is truly amazing. Since Fichtelberg is more one German side, you can visit the English version of the official page https://www.fichtelberg-ski.de/nc/en/news/ where you will find all up to date prices for winter services. 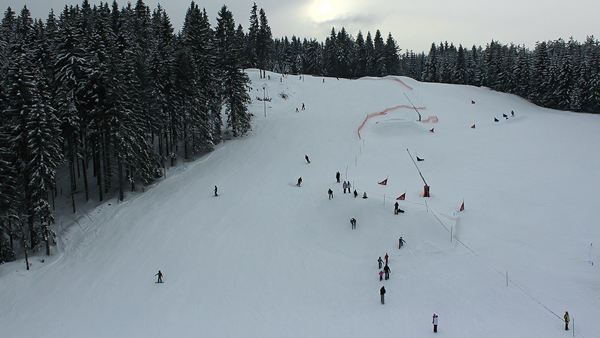 Ski resort Merklin is highly popular with beginner skiers and snowboarders, who love short ski run with a poma lift. If your aim is to go for some not-intense activity near Karlovy Vary – this is the best place. I would describe this resort as beautiful and very easy. This is a great spot where you can start you ski or snowboard life. Moreover full day admission fee to the resort is 8 Euro for a day. Ski resort Naprava is located near Krusne Hory and famous spa center Jachymov. Going to this ski areal you will find blue, red as well as black routes in perfect condition for skiing. 3 lifts operate on the hill and one is designed especially for young skiers. Besides, if your children do not know how to ski – there is a school to take lessons. Trainers English, German and Russian. On the spot, you will find free parking, restaurants, ski services, rent offices and shops. 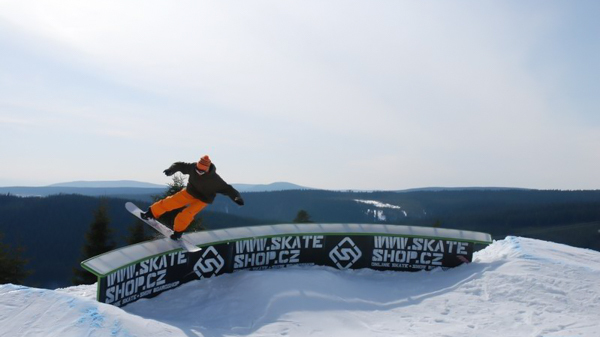 Ski resort Potucky is also located near Karlovy Vary and offers 400 meters of high-quality routes. There are 2 lifts on the height of 720 and 810 meters above sea level. All trails are marked blue and designed for beginner skiers. One-day ski-pass will cost you 9-11 Euro, which makes the place a good start for kids. The ski center Neklid is located at an altitude of 850-1135 meters above sea level near the town of Bozi Dar. The distance from Prague to the place is only 135 kilometers and about 40 kilometers from Karlovy Vary. The complex includes 8 hills of different levels of complexity and 7 lifts, so both beginners and experienced riders enjoy the slopes. There are 2.2 kilometers of blue trails, 3.7 of red ones and 0.3 of black. Ski-pass for one day costs 15-21 Euro. 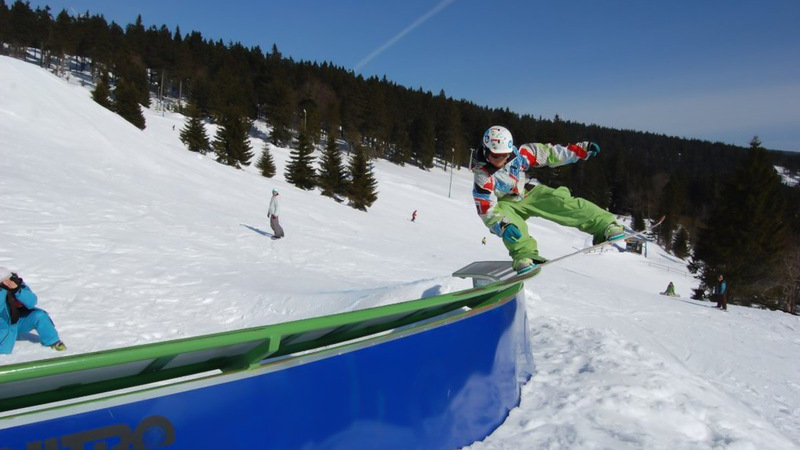 Snowboarders can enjoy special jumps on the tracks or a go wild in a snow park. In addition, the total length of the cross-country ski tracks near the complex is 97 kilometers. On the territory of the center, there is also a school and equipment rental. Buses of regiojet company depart almost every hour from Flornc and Smichov bus stations. Usual price for one way ticket is about 6-8 Euro, but don’t forget to see sport equipment regulations, if you travel with your own skies or boards. Trains also go from Prague to Karlovy Vary, but they are quite slow. One way trip takes over 3 hours and costs about 15 Euros per person. But the easiest way to get to all the ski resorts in Kalovy Vary is a car. If you plan to visit one of the places Klinovec, Neklid, Potucky, Naprava, Merklin, Fichtelberg or Novako and don’t have a car, you can rent one. I have a complete manual of how to rent a car in Prague. Using the form below you can do it with no fear or risks. I hope that this article will help you to plan a trip to one of the ski resorts in Karlovy Vary and you will enjoy the ride. In case of any questions or special requests, feel free to contact our team via email: mail@vovanovaque.com to get detailed plans and recommendations. We believe, that Czechia is more than just beer and red roofs. The place is perfect for family holidays, as it offers a well-developed infrastructure. Here you will get both excitement and pleasurable emotions after staying.